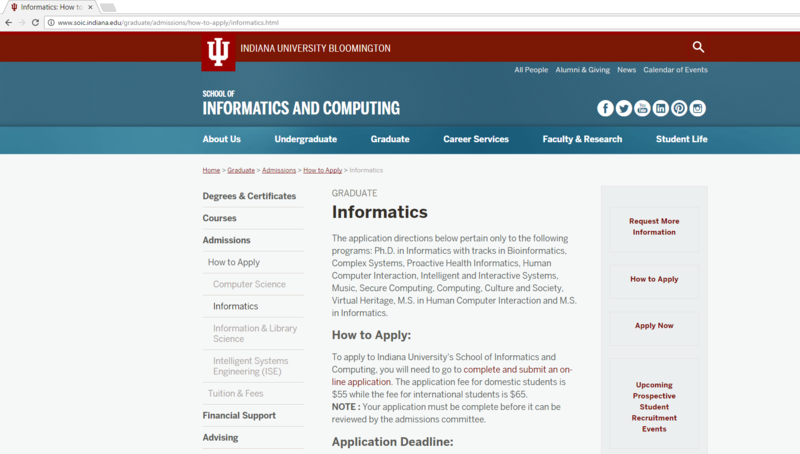 To apply to the Computing, Culture, and Society track within the School of Informatics and Computing follow this list of instructions. Please adhere to the deadline of January 1. Note there is no Master’s Degree under the track of Computing, Culture, and Society. Only PhD! Once, you have reviewed the information please start an application by clicking on “Apply Now” on the first website linked above. If that does not work, please click here. Create your login and follow the list of steps and add in the required documentation for the program. Please fill out everything to the best of your knowledge and turn in all required documentation (i.e, Letters of Recommendation, Transcript, Resume/CV, etc.) Any required documented that has not been submitted by the application will count your entire application as incomplete.